Niro SSS 2.1 home cinema system arrives in the UK | What Hi-Fi? On the surface it looks like a typical 2.1 system, with a pair of speakers and a subwoofer, plus a separate amplifier. Take a closer look, however, and this set-up is a little different. The larger speaker contains three 3in drivers, for front left, front right and centre channel duties; while the smaller speaker contains two 2in drivers for left and right rear surround effects. 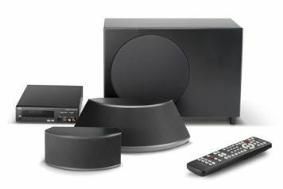 But here's the twist: both speakers are designed to be placed in front of the listener, the front surround speaker below the TV screen and the rear effects one above the screen. Niro claims this produces a wider listening area, with significantly improved resolution, space and height to the sound generated by each speaker, while rear surround effects are created without the need to place any speakers behind the listener. Bass frequencies are handled by the subwoofer with 8in driver. The system is powered by a compact digital amplifier that delivers 3 x 30W to the left/centre/right speaker, 2 x 30W to the rear effects speaker and 50W to the subwoofer. It decodes standard Dolby Digital, DTS and Dolby Pro-Logic II soundtracks. The company says the Niro SSS system is designed for use with screens up to 60in and should be placed at a listening distance of 8 to 10 feet. The Niro SSS is available now for £1575 and is distributed in the UK by Metropolis Music. Designer Niro Nakamichi is the son of the founder of Nakamichi, and was responsible for the design of some of the company's classic tape decks. In 1998 he left the company and founded Niro, which initially made the very high end 'Power Engine 1000' monobloc power amplifiers and 'Control Engine 1000' preamp. The first of his innovative three-speaker 6.1-channel systems, the Niro Two, was launched in 2004. It used proprietary 'Niroson' surround processing to create the surround effect from a two speaker bars, on in front of the listener and one behind, the design being based on recent psychoacoustic research. The company still makes its high-end amps to order: a complete preamp and monoblocs system will currently set you back about £44,000. Power output: Base speaker 30w x 3. Top speaker 30w x 2. Supported audio formats: Dolby Digital, DTS, Dolby Pro-Logic II. Input terminals: 4 digital (3 optical, 1 coaxial), 2 analogue. Output terminals: 8 Ohms base speaker. Digital inputs: coaxial RCA, DVD/CD optical. Sat/Cable optical.